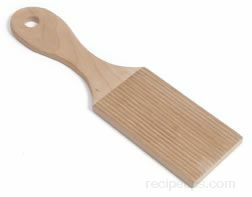 A wooden utensil used to form ridges in pasta, such as for garganelli pasta or to help form the delicate balls for gnocchi, a dumpling-like creation common in Italy. 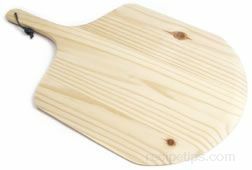 For the garganelli pasta, the pasta dough is placed as a square of pasta, onto the butter paddle and with the use of a dowel, the pasta square is rolled up across the paddle forming ridges as it is rolled. The ridges help to retain the pasta sauce when it is served over the pasta. 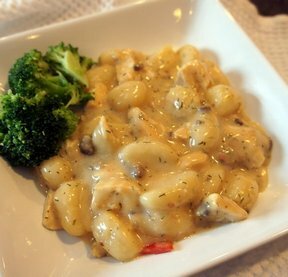 When used for making gnocchi, the paddle is most often used to make potato gnocchi, a variety of gnocchi that uses flour and potato dough that is formed by rolling the dough into long lengths of round strands. 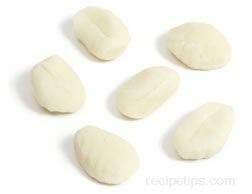 It is then sliced into 1" pieces and shaped into rounded dumplings by rolling the board over the 1" pieces, creating ridges as the dumplings are formed.